The sun is shining as I write this, and this may (or may not!) be my last soup post for a while. No promises, but the warmer weather and promise of fresh produce from farmers will probably lure me towards other culinary endeavors. But for now, I want to talk to you about how much I love red lentils, especially when combines with curry flavouring! For me, this has become the ultimate in comfort food. My son’s wonderful nanny was raised in India and often cooks a simple dal for his dinner using red lentils, onion, garlic, ginger, curry, garam masala, and whatever green vegetable happens to be kicking around (usually spinach, swiss chard, or kale). She serves it to him over brown rice, and then I spend a few days happily devouring the leftovers for lunch or quick dinners. I’m so addicted that I now also regularly make it for myself. 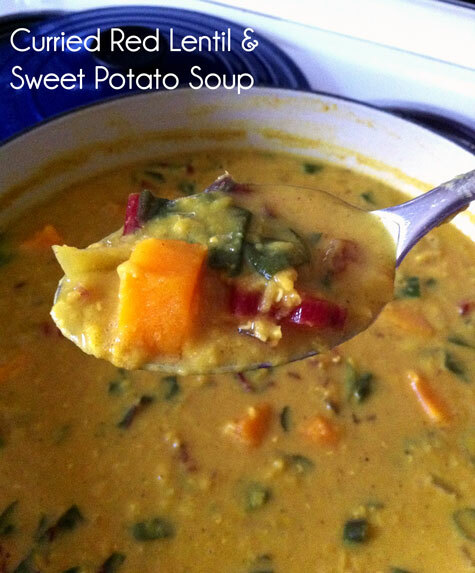 I’ve used red lentils in soup before, but when my Front Door Organics delivery came a while back it included a recipe for a red lentil coconut curry that also used sweet potatoes and swiss chard. As fate would have it I happened to have some sweet potatoes hanging out on my counter and a can of coconut milk in my cupboard, so clearly, this meal was meant to happen. There are a lot of reasons why this soup is good for you, but some of you might be turned off by the use of full fat coconut milk. Coconut got a bad rap after it was mistakenly accused of being a contributor to cardiovascular disease and elevated cholesterol levels, when in fact it is the hydrogenation process that makes it bad for you (along with any other hydrogenated fat). A significant amount of the fat in coconuts is actually a medium-chain fat called lauric acid, which has significant health benefits including compounds that are antibacterial and antiviral. Medium-chain fats are also easily absorbed by the body and are preferentially used as an energy source and burning them actually increases metabolic rate. Whoa! So, please don’t avoid coconut oil and coconut milk and please don’t use low-fat coconut milk as it lacks the beneficial fats. Sweet potatoes – these humble orange root vegetables are called potatoes but are actually member of the morning glory family. They are an excellent source of carotenes (due to their colour – the darker the better! 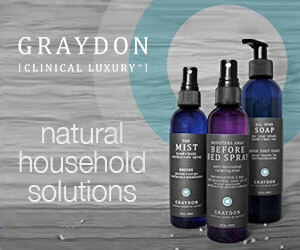 ), vitamin C, and B6. They contain unique root storage proteins, which combined with their high carotene and vitamin C content makes them an important part of boosting antioxidants in your body. Red lentils – in general, lentils are nutritionally similar to other common beans in that they are a good source of protein, fibre, and folic acid. Their fibre content helps to lower cholesterol, as well as manage blood sugar disorders by preventing blood sugar levels from rising rapidly after a meal. Research has also shown a reduced frequency of breast cancer in women who have a higher intake of beans and lentils. Swiss chard – this leafy green is rich in chlorophyll, fibre, vitamins C,E, and K, and is also an excellent source of carotenes. It is an excellent source of many minerals, including magnesium, iron, and potassium, and also contains calcium, B6, and folic acid, just to name a few. Due to its high chlorophyll, carotene, phytochemical, and plant pigments Swiss chard is actually considered to be one of the most powerful anticancer foods, especially against digestive tract cancers. Step 1 – Saute the onion in a large pot over medium-high heat until soft and translucent. Add the garlic, and ginger and cook for a few minutes more, stirring frequently (do not let the garlic burn). Reduce heat to medium-low and add the curry powder, curmin, and turmeric. Cook for a minute, stirring, and do not allow the spices to burn. Step 2 – Add the stock, sweet potatoes, chard stems and red lentils, increase heat and bring to a boil. Reduce heat and simmer until lentils begin to soften and break down (approximately 20 mins). You may need to add water during this process if soup starts to thicken up too much. 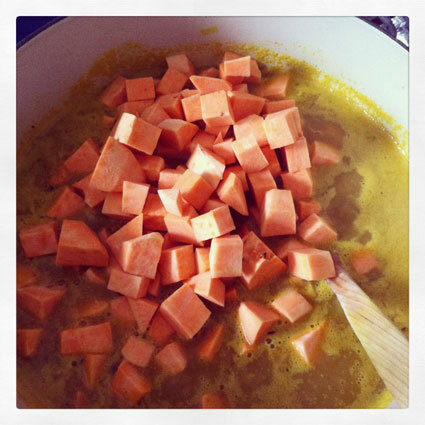 Step 3 – When sweet potatoes and lentils are tender you may use an immersion blender to puree part of the soup. Alternately, pour part of the soup into a blender and puree then add back into the pot. 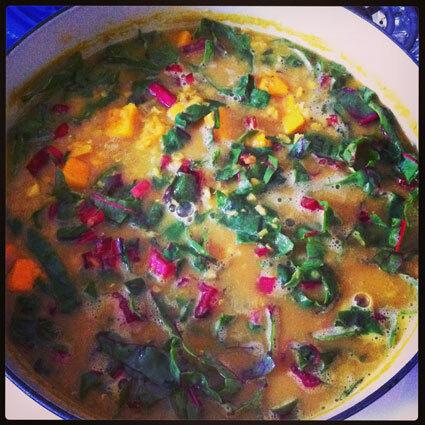 Step 4 – Add swiss chard leaves and coconut milk. Cook until chard is wilted and soup is warmed through. Season with cayenne pepper and lemon juice to taste. Stir well, and enjoy. This soup is amazing on its own, or served over brown rice like a stew. It freezes well and makes excellent leftovers for lunch or other dinners!